There’s no need to buy expensive supplements to detoxify your body. The following tips are just common sense, healthy, easy ways to help your body detoxify naturally. 1. Hydrate by drinking lots of purified water. 8-10 glasses a day with a little fresh lemon is perfect. Lemon boosts the detoxifying effects of water. 2. Eat plenty of fresh, organic fruits and vegetables and drink freshly made juices. A three day water and juice fast can help your body rid itself of toxins and make you feel wonderful. 3. Add more natural fiber to your diet. Whole grain pastas and breads, lentils, beans, quinoa, bulgur, oatmeal, and nuts are wonderful sources of natural fiber. 4. Take antioxidants in the form of fruit and berries. The best fruits for this purpose: blueberries, pomegranate, acai, raspberries, strawberries, cranberries and blackberries. 5. 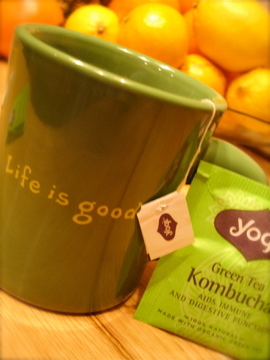 Kombucha tea and/or green tea are terrific purifiers. You can make your own kombucha, or get it in bottled or teabag form. I like Yogi! Are you detoxing before a diet or is this something you just do once in awhile? I was thinking of cleansing/detoxing this month and starting out and the year on a good note. I’ve gained back some of the weight I lost and think it might be a good start to get back in shape again. This is just something I do once in awhile. I’ve started working out more, and I find a little detox gives me more energy. I agree, time for me to get in shape again! Thanks for commenting Maria. I agree, home-grown is best. My house is situated on a steep hill, and until we get a little terracing action happening in our back yard a vegetable garden would be a bit of a challenge. I’ve been growing flowers, tomatoes, peppers and herbs out back almost every year and I think I’ll start doing that again when spring arrives. Thanks for the idea!